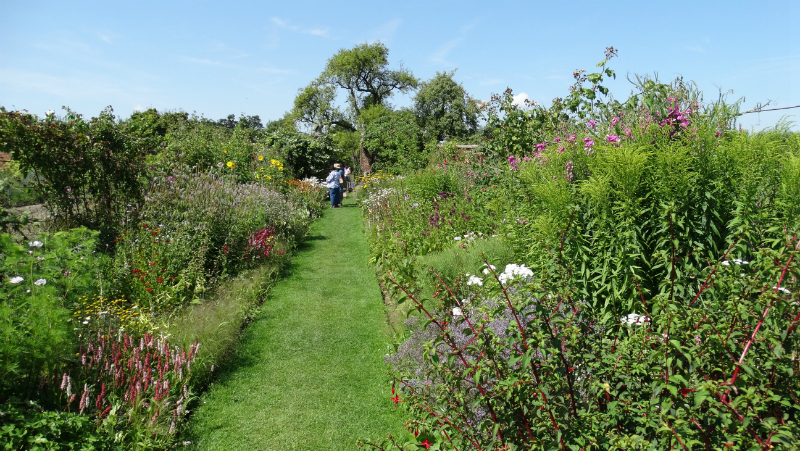 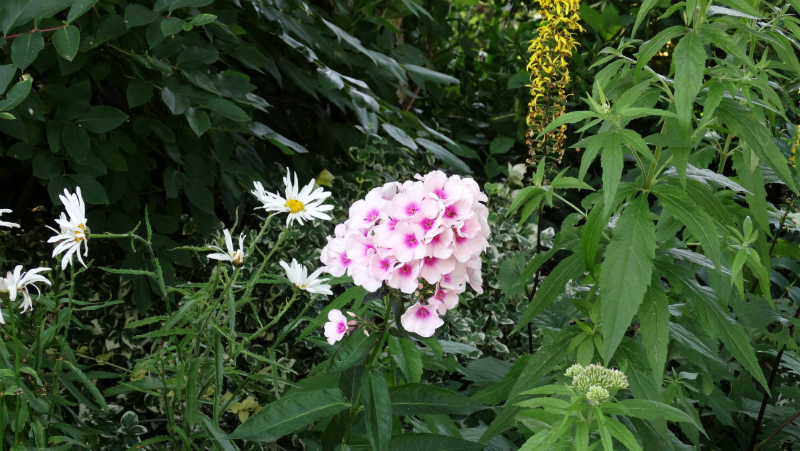 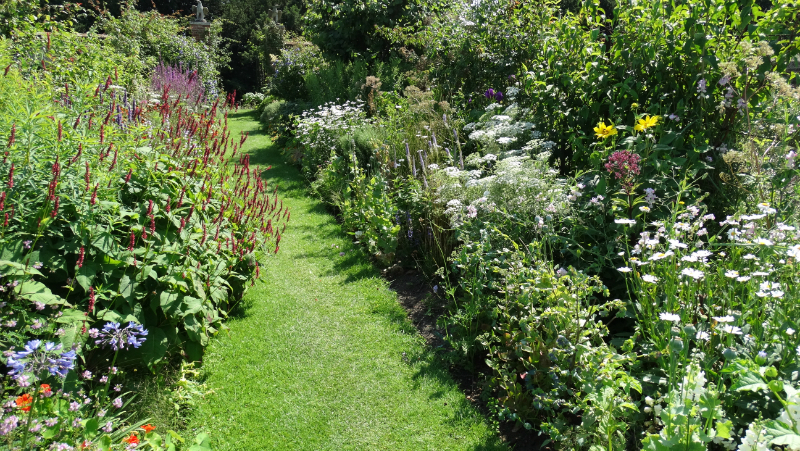 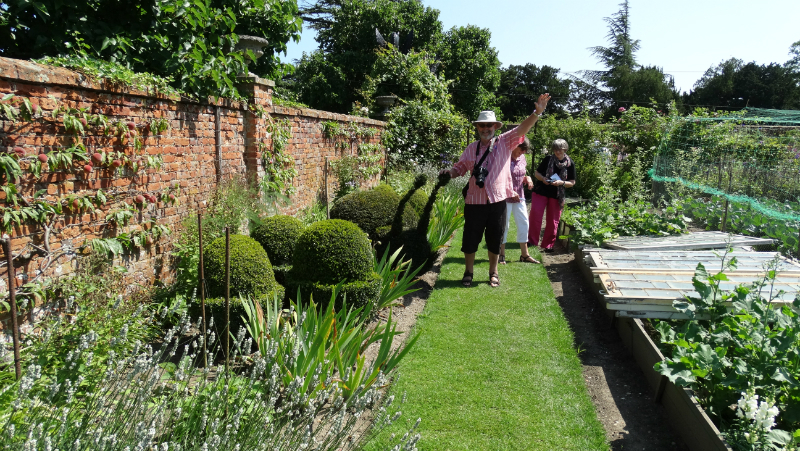 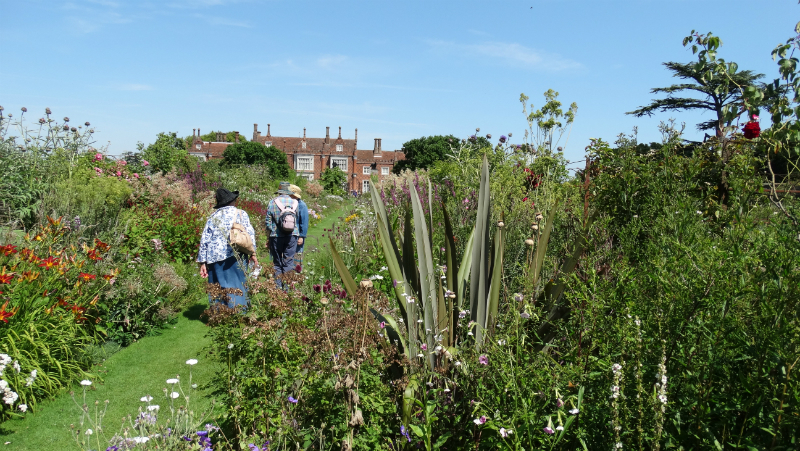 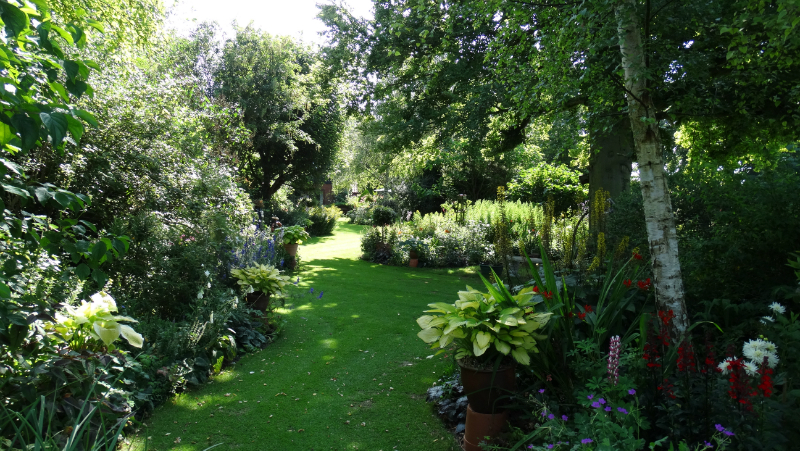 Report on the visit to Woodwards Garden,Coddenham and Helmingham Hall Gardens on Thursday 24th July 2014. 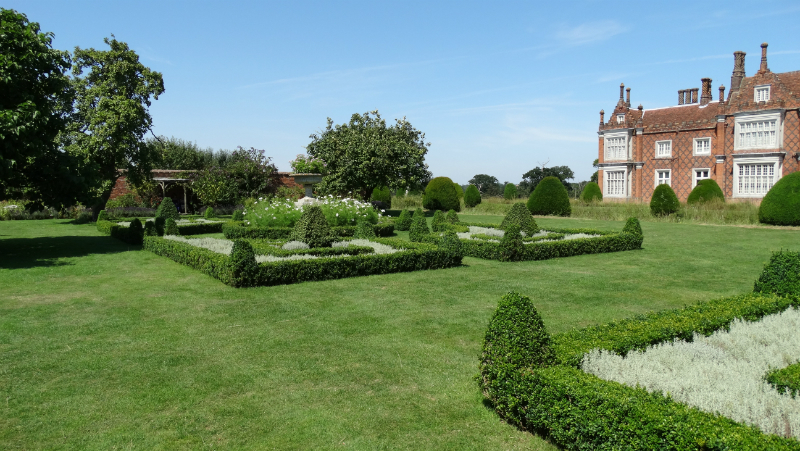 After pickups in Bedfordshire and Cambridge twenty seven members and friends headed for Suffolk to visit the gardens at Woodwards,Coddenham, and Helmingham Hall. 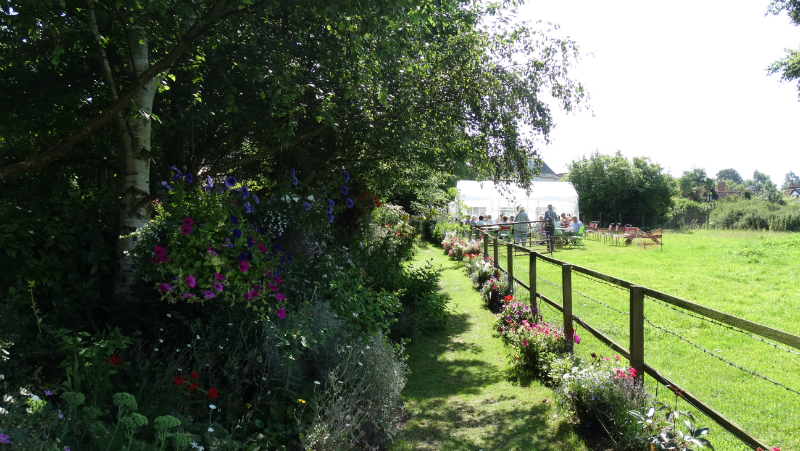 This was our second visit to the County this year and again we had glorious weather throughout our trip. 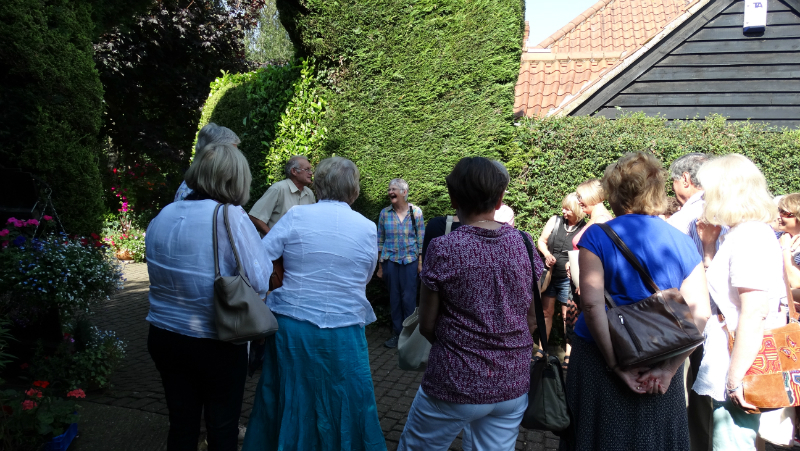 On arrival, Richard the owner, explained the development of the gardens from a building site to its current 1.5 acres. 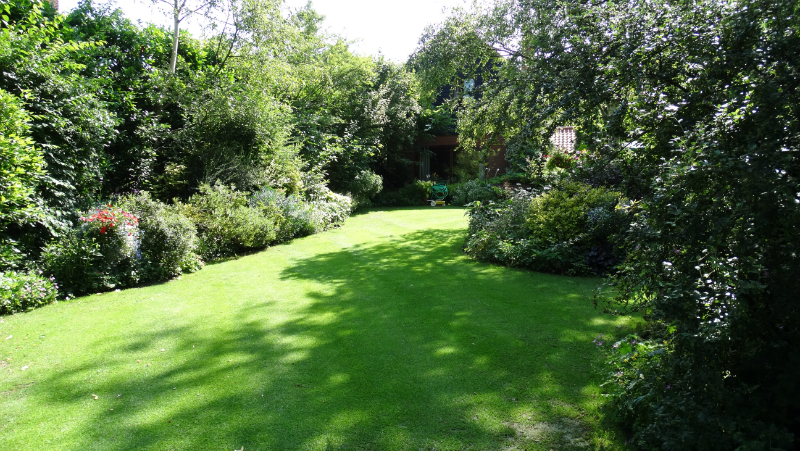 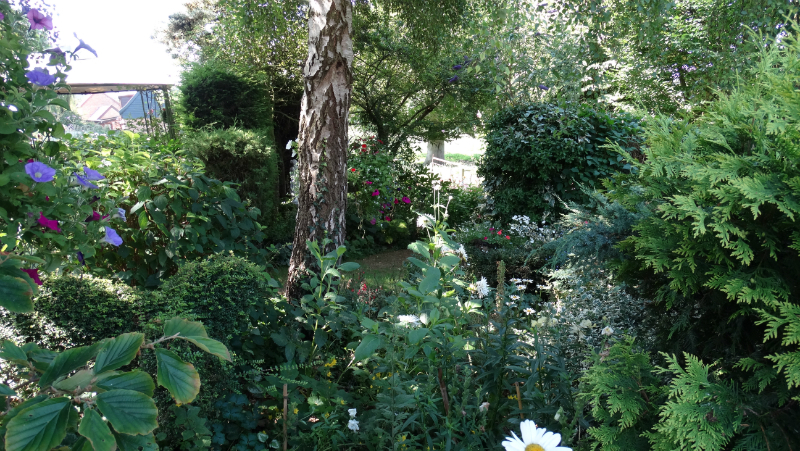 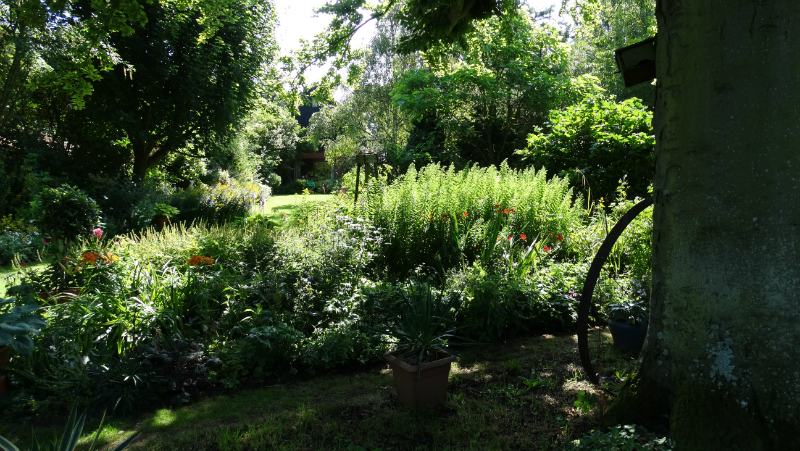 The garden is South facing and gently sloping with views over the rolling Suffolk countryside. 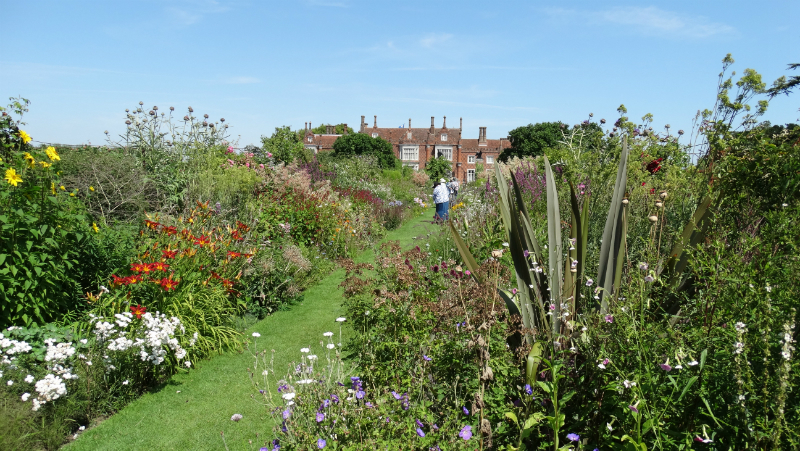 There were many large pots of annual plants in the upper part of the garden which gave a blaze of colour. 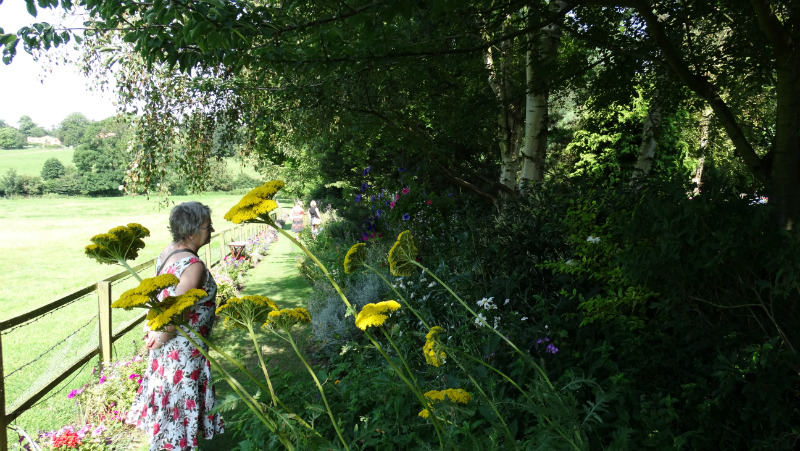 Shortly after arriving we all enjoyed tea/coffee and homemade cakes, prepared by Richards wife Marion, before exploring the garden. 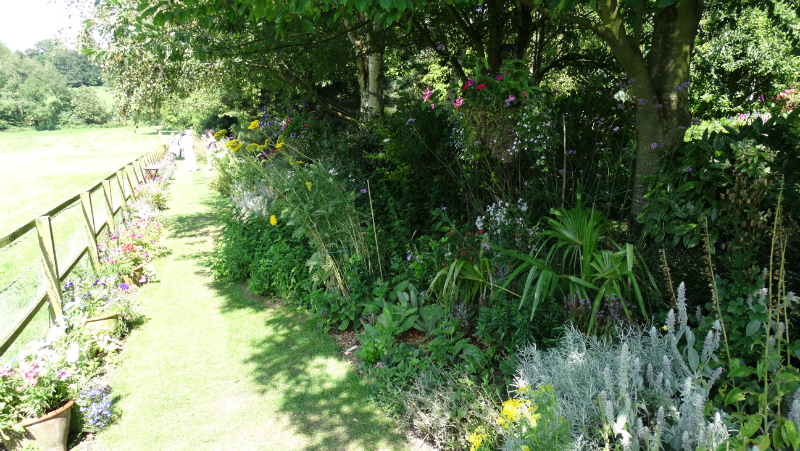 Several mature trees provided shelter and the island beds were well stocked with a variety of plants. 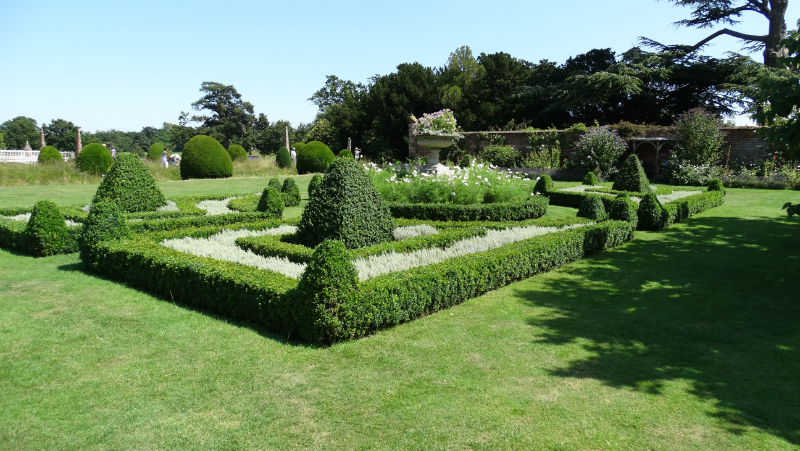 There were quite a lot of golden plants, including golden Conifers, golden Hosta’s and as gold leafed Caryopteris which certainly brightened up the beds under the trees. 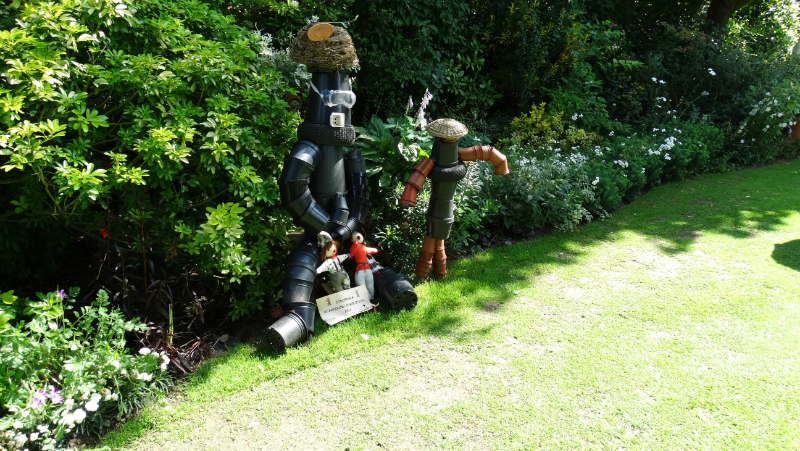 One or two features caught our eye including a scarecrow made from plastic flowers pots and other discarded material including a barrow tyre. 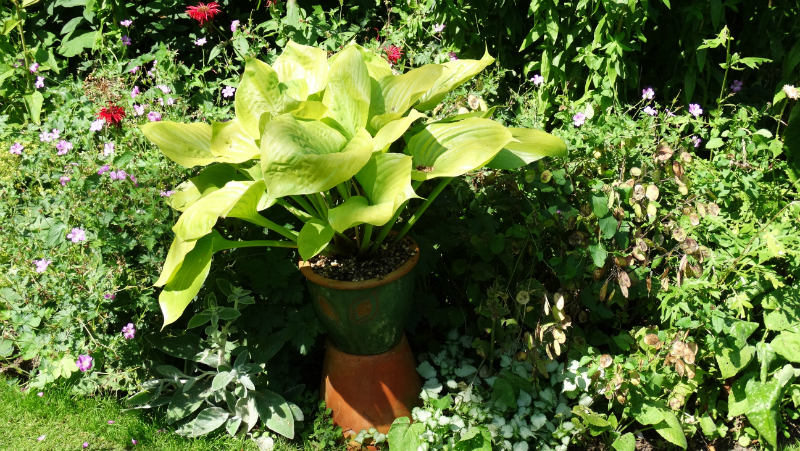 Also noted was that many pots of Hosta’s had been raised by standing them on another inverted pot. 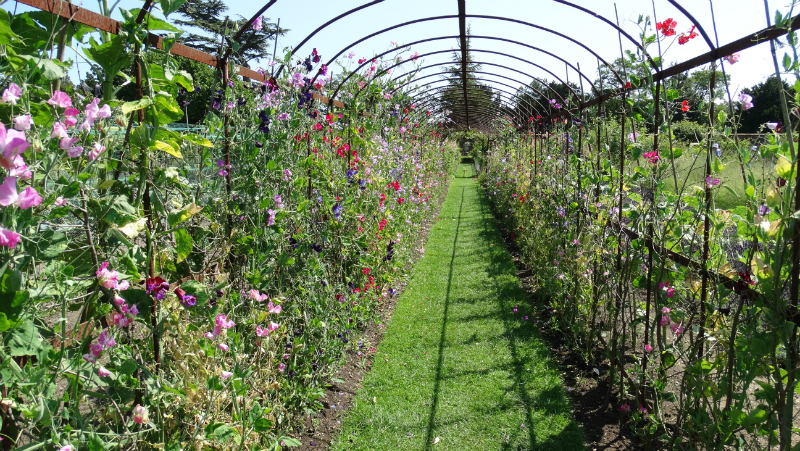 This prevented slug infestation or at these helped to prevent it. 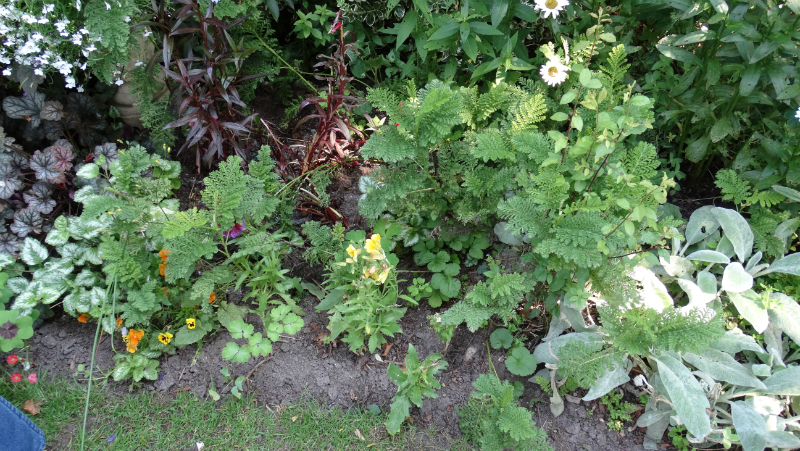 Other plants we noted were a blue Mecanopsis (not in flower), Phlox paniculata ‘Grey Lady’ Persicarias and Heucheras. 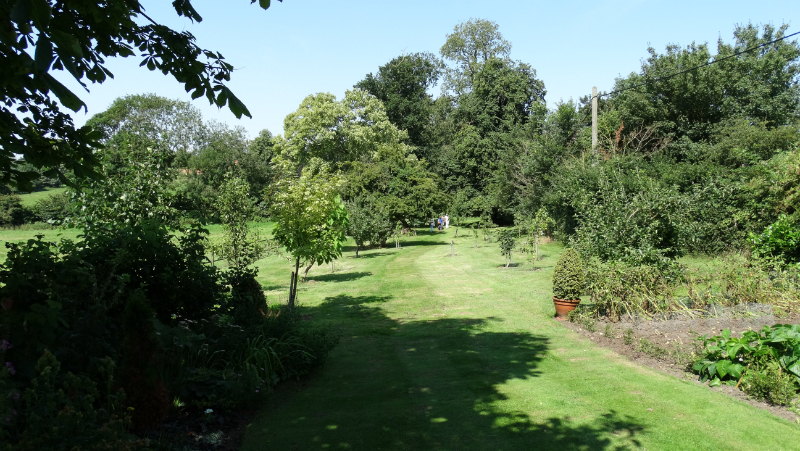 At the end of the garden was a well-stocked vegetable area and an orchard. 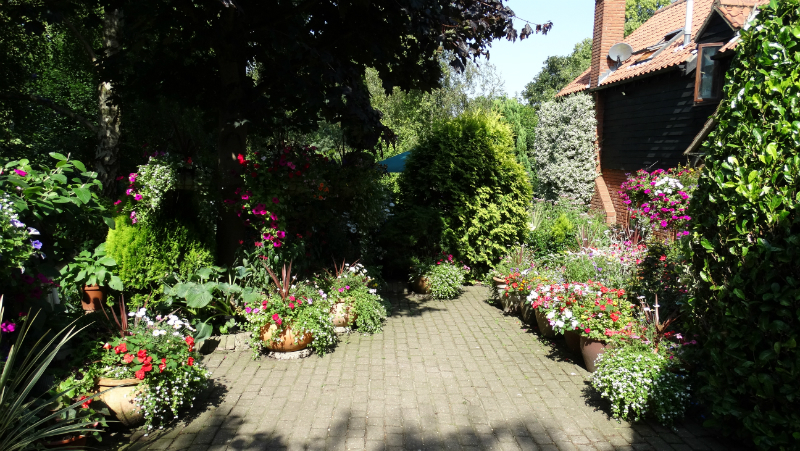 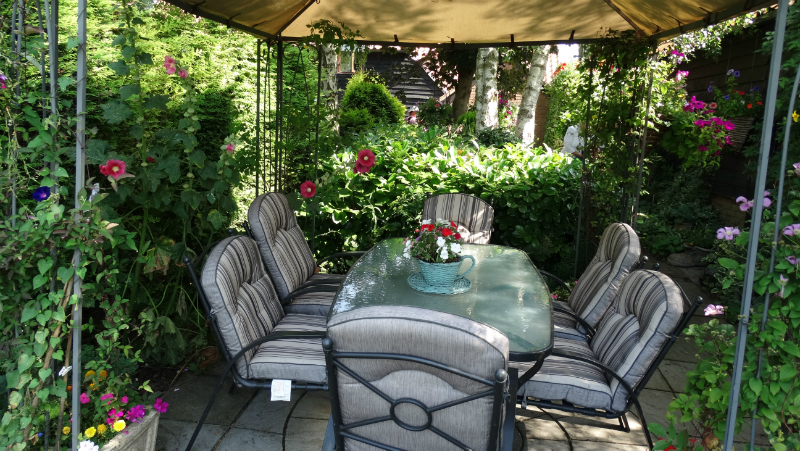 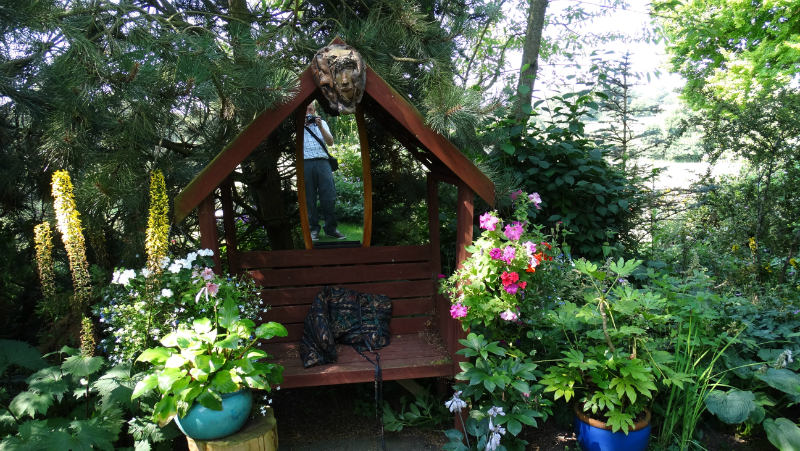 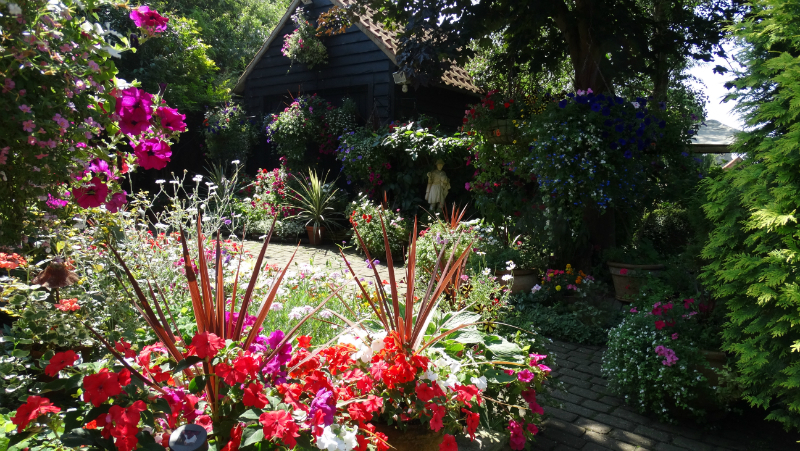 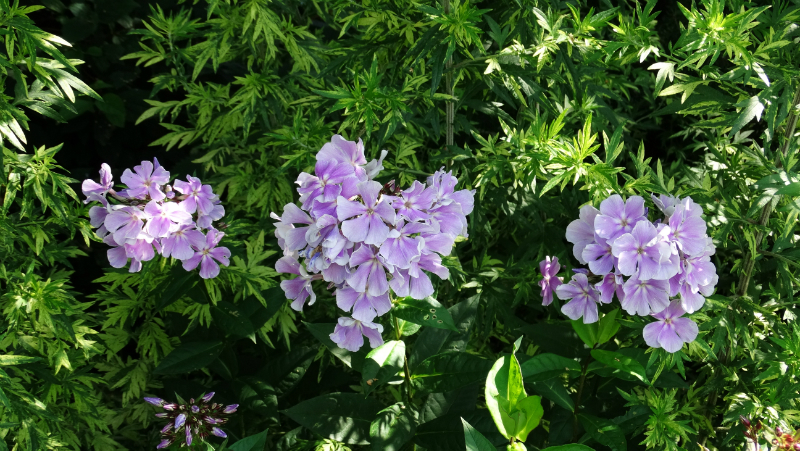 Richard the owner admitted to spending about 60 hours a week in the garden, and from the amount of pots you could see that watering may have taken up a lot of time as Suffolk is a very dry county. 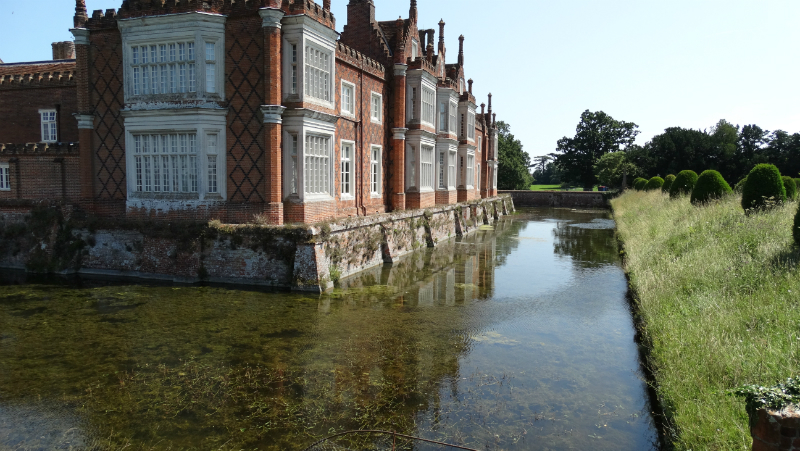 At mid-day we travelled the short distance to Helmingham Hall. 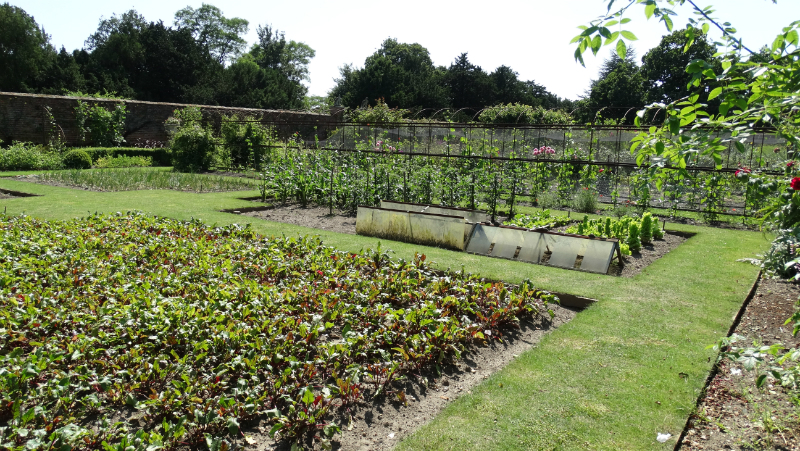 The gardens are set in a 400 acre deer park. 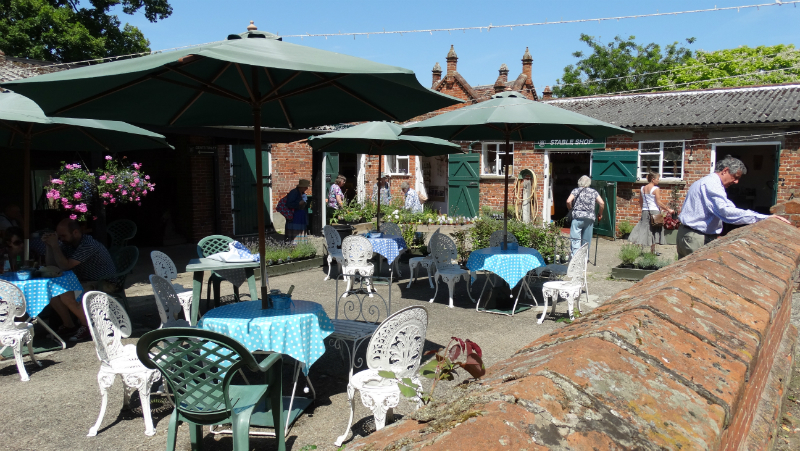 On arrival most of us took lunch in the Coach House tea room before venturing into the garden. 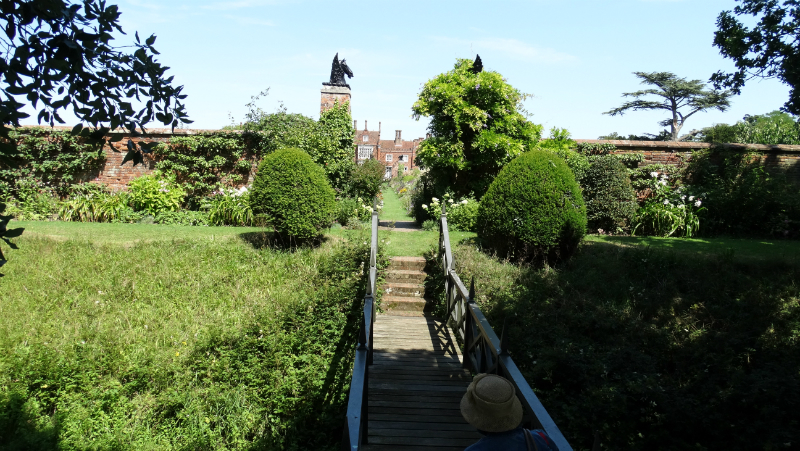 The Hall is moated on all sides which is quite unusual and entry can only be made by using the drawbridges on two sides of the building. 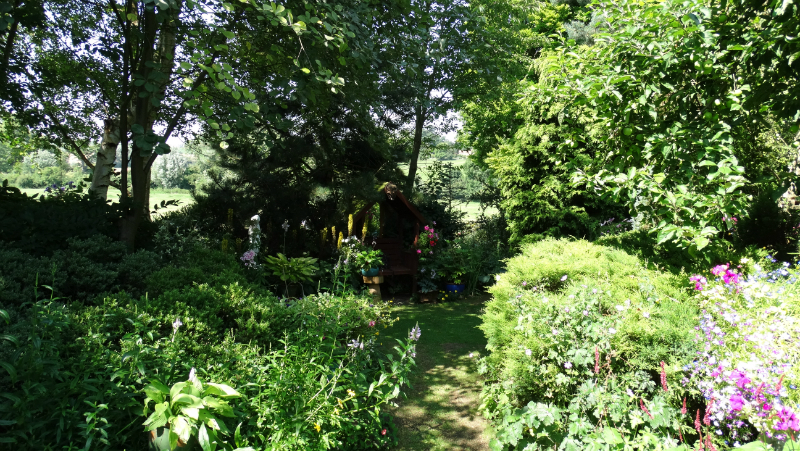 We wandered through the deer park and into the garden areas. 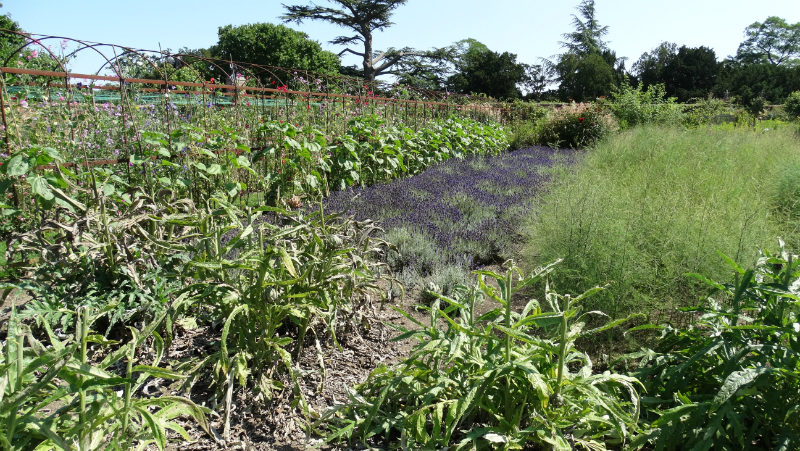 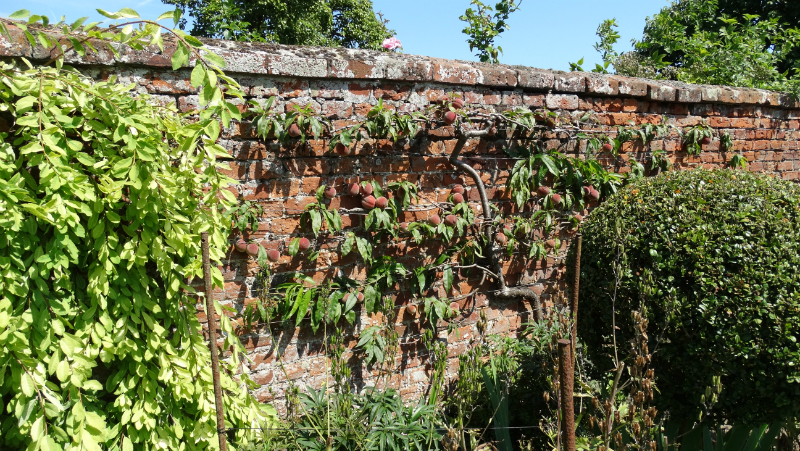 There is a walled kitchen garden, herb, knot, rose and wild garden. 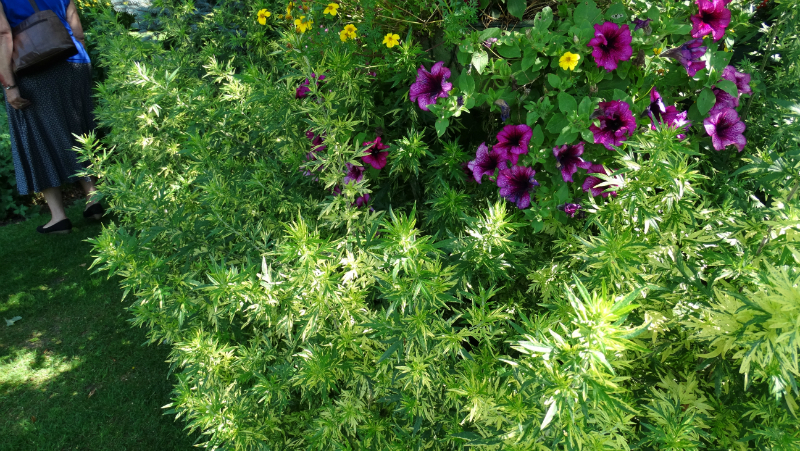 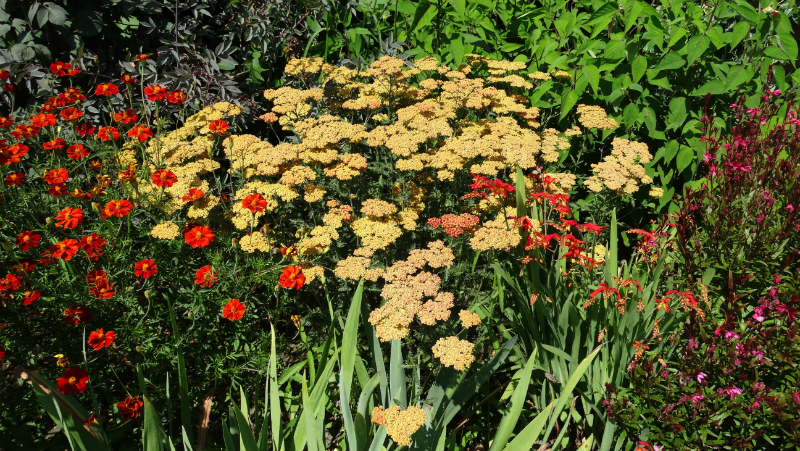 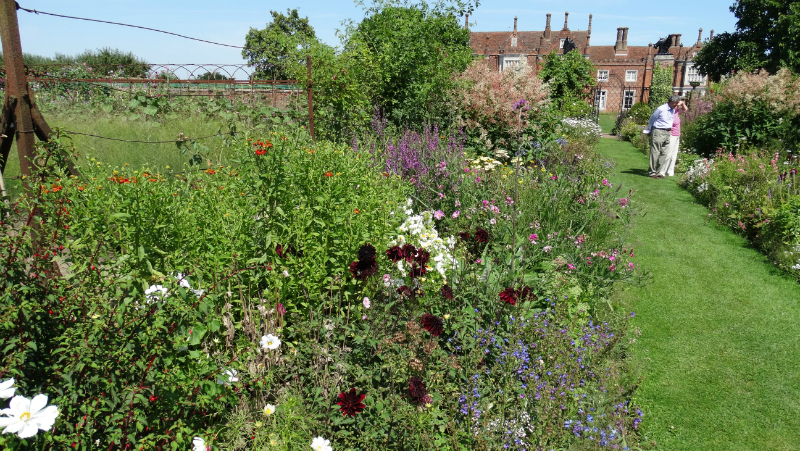 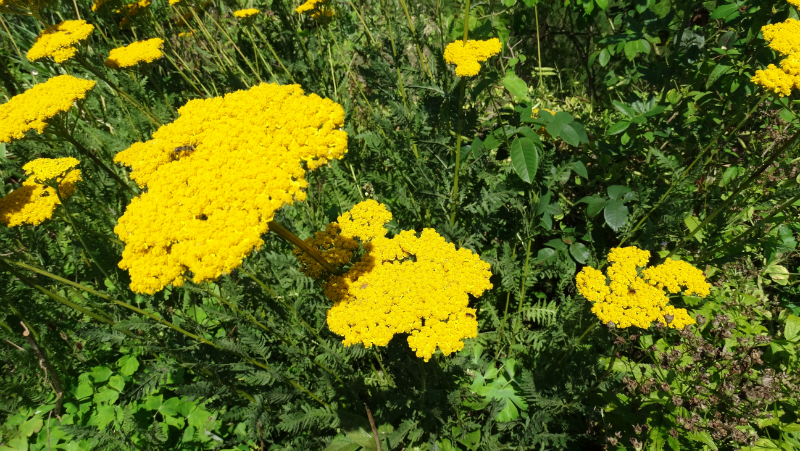 The perennial borders were bright with colour and attracted many bees. 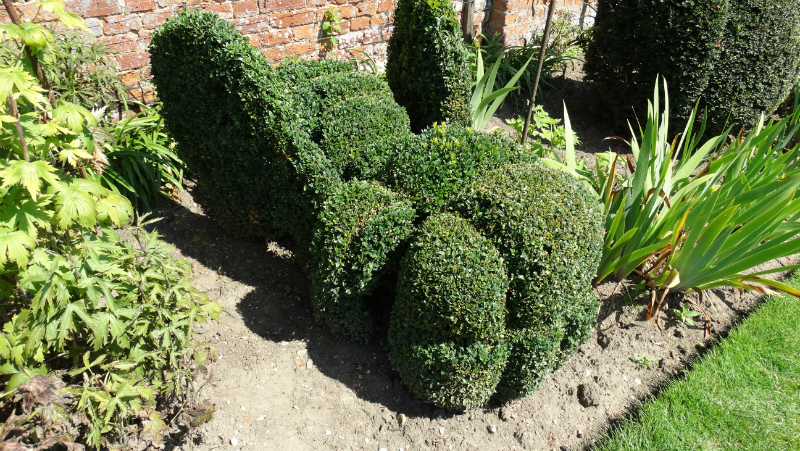 There were many lovely examples of topiary, ‘the Snail’ caught our eye but ‘the Bear’ was also very good. 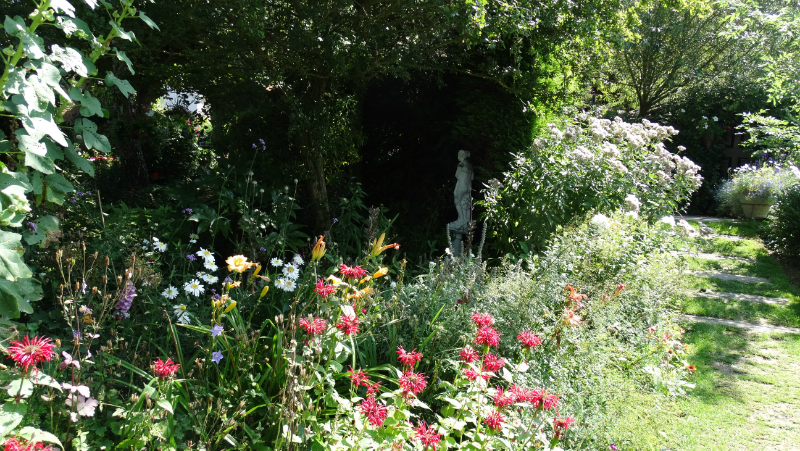 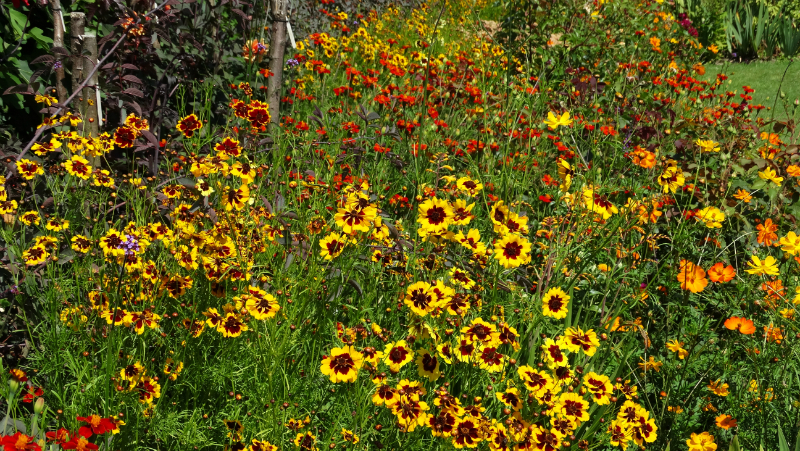 As we continued through the gardens plants that impressed were, Indigofera’s, Helianthus, Hemerocallis, and Helenium’s (one a beautiful burnt orange colour). 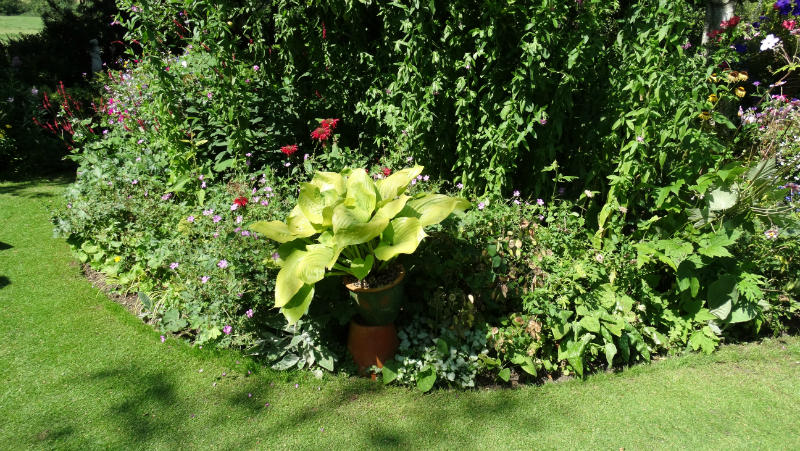 In a very warm and sheltered corner of the walled garden was a very large plant of Salvia involucrata ‘Bethellii’. 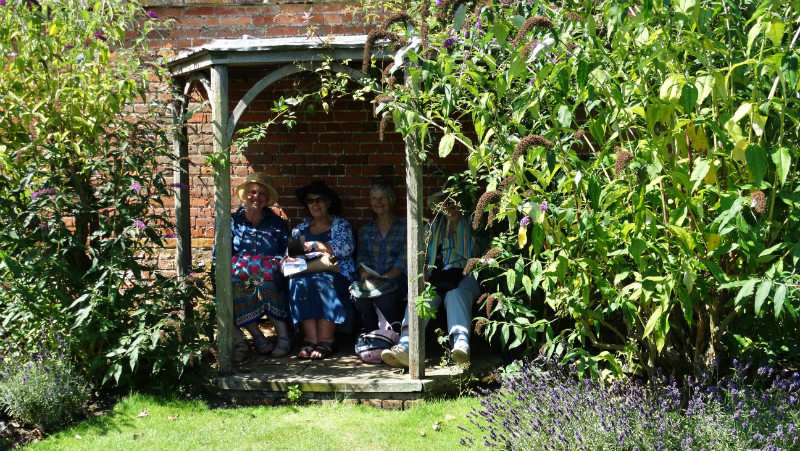 Although one should not complain the heat was overpowering and many of us sought out benches in sheltered areas. 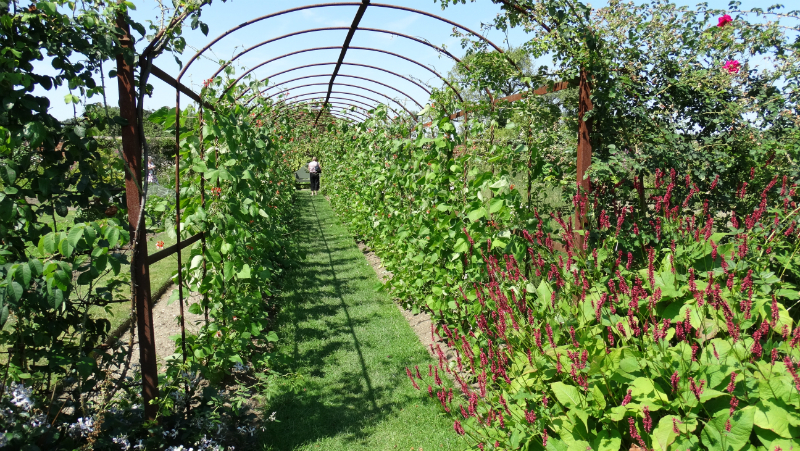 Some of these seats were sheltered by several large Mulberry trees all in fruit. 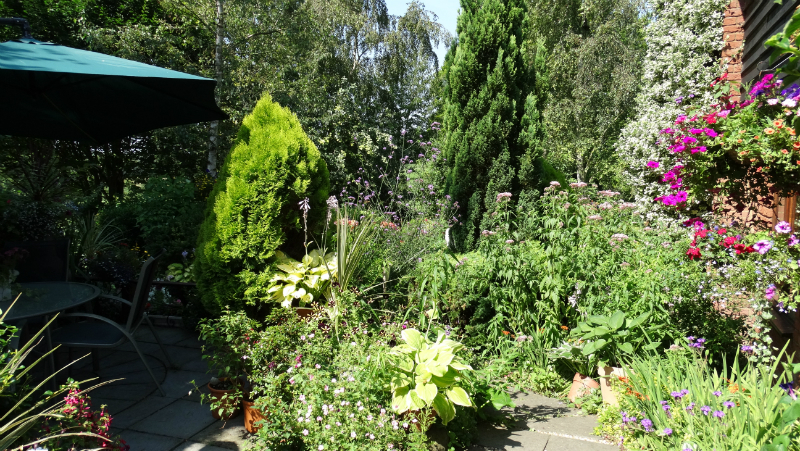 There were many other plants and trees in the garden too many to mention here.